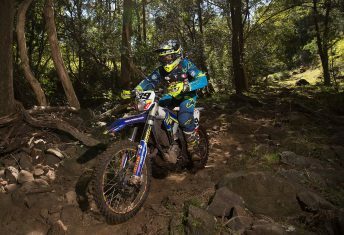 The Womens, Vets and Masters classes put on a riveting display around Kyogle for Round 10 of the Yamaha Australian Off-Road Championship (AORC). Eight tests were conducted over the course of day to determine the placings. The three standouts for these classes were Jemma Wilson, Kirk Hutton and Derek Grundy, to demonstrate top-notch skill and commitment around the tracks. The AORC also had its first champion in 2017 crowned, after Grundy scored enough points to claim the title! With Yamaha rider Jemma Wilson once again claiming a victory for Round 9, there was a significant amount of expectation to see if she could claim yet another win. Wilson managed to take the victory with a total time of 1:02:58.653. Finishing behind Wilson was Emelie Karlsson on a Yamaha with her time of 1:04:03.203. Just over a minute would separate the two. Despite missing out on the win, Yamaha rider Sophie Coldicutt managed to salvage a podium result with her third place. Her time of 1:04:36.107 was a further 33 seconds behind Karlsson. In the Veterans, the legendary ‘King’ Kirk Hutton would be the eventual victor, with a total elapsed time of 58:12.030 and his pace in the seventh test was spectacular. Hutton on his Yamaha was well ahead of his closest challenger in Damian Smith. Smith in second placed a further 41 seconds behind with his total Enduro time of 58:53.560. Brad Wilkinson was the final podium placer in third place. Wilkinson registered a total time of 1:03:01.661, over four minutes behind Smith. DSR Motul Pirelli Sherco Off-Road Team’s Derek Grundy put in a sensational ride to win the Masters class championship, with two rounds remaining! Grundy was visibly excited to finally get that well deserved championship. As an assistant team manager to the Sherco team, it certainly meant a lot for Grundy to deliver the title to his crew. Grundy took a total time of 1:03:07.284 to complete the Enduro. Up next in second position was Craig Treasure on his Husqvarna machine. Treasure finished more than two and a half minutes behind Grundy with his time of 1:05:48.274. The final Masters competitor on the podium was Brett Kenny, approximately 66 seconds behind, with his time of 1:06:54.631.